So our young man came for a Christmas visit. It was so exciting because even at age 16, he believed there is a Santa Claus. He functioned on about a 8 year old level emotionally. My husband and I made sure Santa came to visit him and brought some of his favorite things and of course needed things. It was truly an extra special visit. We were all three sorry it ended so quickly, as visits were special because he lived in a facility over 5 hours away. This long drive made it difficult to do quick visits or day trips. We spoke to the placement specialist afterwards and requested to try again with our special young man. It was at this time we were requested to sign up with another agency that could provide extra services for our boy. At first we were told it wasnt a big deal that we might have to take a class or two and the rest of our home study process would be accepted by the additional agency. Then we were told it was a mistake that we would need to take additional classes and redo the whole home study process. We did not want to go through the whole process again. Especially when our boy had already been in our home for quite some time and we were well aware of his needs and the services that would be required for his best welfare. So we balked at this prospect. Then it was suggested we could go through a different agency that wouldnt require so much, I said we would consider it, please have a representative contact us. The specialist informed me I needed to contact that agency, so I did. The agency seemed a little befuddled that I was contacting them and not the placement specialist and explained to me its not as easy as I was told (once again). I contacted the specialist with this information and she said she would contact them and get back to me. In the meantime we had requested another home visit with our boy. He called me almost everyday and was doing great in school and with us. He asked me each time I called was the visit approved and I would have to reply “not yet”. He was becoming agitated at this thinking the worse that the visit would not get approved. His agitation always manifested itself in acting out at school toward others. He ended up with an overbearing restriction that prevented us from speaking with each other for a short time. While this was going on, the meetings between the specialist, myself and his team were continuing and we were at a standstill because they wanted us to add this extra agency and didnt want to have to travel the boy back and forth for the 5 hour trips, much less have to case manage him from this distance. The point of the second agency was to relieve them of this hassle during the adoption process which would only involve a couple months time. While the process was dragging on and I was trying my best to fight for him as I had for over a year now, I allowed another foster child to be placed in our home. A teen girl. I didnt see a problem with this because I was starting the process to make a new extra special room for our boy. Plus he was going to be permanent and she only had less than a year before she would be on her own at age 18. It was during this time I called to have our daily talk and the person who answered the phone informed me I was no longer permitted calls with him and if I had any questions to speak with the office. I had just talked to him the day before!! What is this craziness? I contacted the placement specialist, she informed me he was being placed with another family for adoption and was being moved to their home in a few days and it was best if I didnt speak with him for awhile. Stunned, heartbroken, ummm, I about lost my mind, no one warned me, I didnt know what to do. I contacted a lead person in the Children Services Adoption office and requested their help with the misleadings, the unfairness, etc. Ultimately I was told this was the best thing for him because the family had another autistic child and was closer to his case managers. I was told I could talk to him soon. I was also told all the work I had invested him was evident and this great opportunity for him was possible because of my believing and fighting for him and teaching him many valuable things. Now I know this should have made me feel better, but it didn’t it only broke my heart more. I cannot tell you the reader in mere words how much I love this young man. He made me laugh, he made my day everyday in so many small ways. I didnt mind the work, he was a joy to me. Yes he struggled to get along with my husband because of male figure abuse he endured early on, but that was going to be something he would have to work through anywhere. He was doing a great job on building the male relationship with my husband. Sitting here and telling this part of the story reminds me how much losing him still hurts my heart. I cant take down his pictures because he will always be a part of my heart. I have contacted his placement specialist a couple of times to check on him and make sure he is doing well. I have been assured he is doing great with his new family and the adoption is almost done. I asked to send him a Christmas present and was given an address where I could send it. I did not send one because I can not allow myself to interfere with his new life and I have to let go. It hurts too much to revisit his place in our home and heart still. I know there will come a day when it will be ok, but that day has not come yet. Coming up next…The new Foster Child…. This is an ongoing blog about my journey and daily life after the diagnosis of Hemochromatosis. I am writing this blog to help others who suffer from this disease to know they are not alone AND to help me release some of what I am going through. Today is not a good day for me; my joints are hurting, my depression is at a high level and I dont have the energy to crawl out of a wet paper bag. But I refuse to give up, I refuse to waste this day. No matter how I feel, today cannot be regained once it is over and I want to make the best of it I can on any level. I know the Holy Spirit is here with me helping me every step of this day. I do not need to worry about tomorrow, because it will be here soon enough. I have a beautiful 6 month Foster infant to care for and she gives me motivation to get up out of the bed and try my best no matter how small or great that effort ends up being. I have been thinking a lot about the future and what it might look like. I do not worry about the future, that is God’s job. But with what I am dealing with, my question is how do I want to go forward?? On top of my own medical troubles, my husband has Rheumatoid Arthritis and my own disease has opened my eyes even more to what he lives through and I understand more about the things he says and our future together. In the days ahead I plan to do a lot of praying to be sure ideas and plans are in His will for me and us. As for today, just writing this update is accomplishing something which is better than nothing and sleeping the day away inbetween baby feedings. I’ve got to remember life is what we make of it, sick or not, life is a beautiful gift. I was recently diagnosed with Hemochromatosis after a long search for the reason for my achy bones and chronic fatigue. My story begins in about 2012, when I began finding it very difficult to get through a workday without involuntarily falling asleep. I tried bumping up my energy level with energy drinks for a while, but it didnt really work for me. I began to have chronic earpain which convinced me to go to the doctor and find out what was going on. This was not an easy choice because I did not have any health insurance and our household income had been reduced to a quarter of what it was due to the economic crash. However I felt poorly enough I called the County Health Clinic and made an appointment. Their fees are based on income so it made it a little bit more affordable. I went to the appointment and they did a lot of bloodwork. The Doctor said my ear did not look infected but had a lot of fluid and looked somewhat abnormal. A new appointment was scheduled to return for test results. The test results showed confusing information that didnt provide many answers. Slighlty elevated liver range, slightly enlarged red blood cell count, and a very low vitamin D3 result. I was told to load up on D3 and see if that makes it better because a low D3 can cause fatigue. Also I was given medication for the ear fluid. Time went by and I returned for a recheck with little improvement. At this time my weight was also creeping up and the stress level at work is growing. the doctor again thought some additional bloodwork should be done. The results were the same except the vitamin D3 level had improved. It was not to the normal level yet, but much better. This time the sugar test showed a higher level indicating borderline diabetes and the arthritis test was slightly high. I thought the diabetes threat was normal with my increased weight and family history of the disease. The arthritis level was explainable too with my aching bones. The ear continued to give me problems but it seemed there was not an explanation for the fatigue and it was chalked up to the ear and work stress. About a year goes by with little improvement and I unexpectedly lost my job. The stress level was on overload and a antidepressant was added with great results. The only issue was the fatigue was ongoing and each day I found myself literally pushing through to get things done and function normally the best I could. It was about this time my husband was made full time at his new job and he would be given medical benefits. We were hopeful of adding me to his insurance next year. In the meantime I worked odd jobs for a little while during a search for a new permanent job. It was at this time I began doing foster care. The foster care decision really helped me in many ways. It fulfilled my passion of servitude, it helped with my empty nest issues, it provided a small amount of income and it was something I could do and still be able to take naps on bad days. Time goes by and the healthcare sign up time has arrived at my husbands work and I am added to his insurance plan. By the way I had previously looked into the Health Exchange Insurance program for coverage, when I worked it was too expensive and when I was out of work I didnt qualify. With the new insurance I went to the doctor for a check up and to talk to him about my existing health issues. I also went for a check up with my OB/Gyn. It was now suspected the fatigue and achyness was a result of menapause. I made the appointment, did some hormone blood work and was put on a very low dose of estrogen. Great, I’m thinking this is the answer to feeling better, wrong! The estrogen did help with the hot flashes but none of the other issues. I continue to live with it for the next year. During this time my family is telling me their concerns because to them I appear to be very ill and dispite my best efforts to hide how I really feel they are seeing through it. It’s November and time to sign up for another year of health insurance has come about. This year (2015) my husband talks me into participating in his employer’s “Blueprint for Wellness” program. This is where you voluntarily go and have bloodwork testing performed to check for potential issues you may not be aware of. It’s designed to be a proactive tool for health improvement. My results came back and they were very alarming. My results were flagged for Cardio CRP, Hemoglobin A1c, Ferritin, MCV, MCH, and Vitamin D. Dropping my overall health percentage to 63%. These results in a nut shell indicate borderline diabetic, High Iron Levels stored in the body, Cardio issues, Enlarged Red Blood Cells and again low Vitamin D. Red flag! I make another doctor appointment. Strangely enough the results make me feel better emotionally. Because, now I know that I am not a hypochondriac there is a real reason for my fatigue and achiness. Internally I worry about people thinking I am lazy or that I am looking for a reason not to do things I should. So I push myself hard to keep going and continue to produce results just as I always have. I expect a lot from others and I hold myself to the same principal. With the fatigue I often feel like a failure and it depresses me, especially when they can’t find a real reason for how poorly I am feeling physically. So the medical testing report gave me peace of mind and added worry as to what all these negative test results add up too. Next Phase…getting to the bottom of it all.. I contacted the Health Department and obtained copies of all my previous testing. With the Blueprint for Wellness testing report and the copies of the previous labs I went back to see my doctor. I am a relatively new patient of his and I dont have a good understanding of his bedside manner yet. This creates a bit of an unsure confidence for me in his dedication to get to the bottom of what is happening to me. On appointment day he reviews all the testing and tells me most women my age complain about fatigue and by the time they are 65 they must feel better because they stop complaining. He also said I could starve myself and lose some weight, this would help the achiness. But he did have a couple concerns with the labs results; the Ferritin level was too high and he wanted to look further into the arthritis testing result. He told me that a “Bloodletting” procedure could help with the Ferritin Level (Iron). But first lets do more tests to be sure there are no false positives. Upon getting the new test results back, the doctor’s office contacted me and said they were scheduling a specialist appointment with a Rheumatologist. I asked what about the rest of the issues, the nurse said nothing was mentioned. I asked her if the doctor would refer me to a Hematologist for the englarged blood cells and ferritin levels. She said she would get back with me after speaking with the doctor. She called back with an appointment for the next week with the Hematologist. The Rheumatologist appointment is over three months away. My confidence is increasing that something was being done to figure out what the root of the problem is. I have a lot of symptoms but no diagnosis at this point. My husband accompanies me to the Hematologist appointment that is scheduled at the local cancer speciality center. The resident intern speaks with us first and goes over all the new test results then the previous. She states her concern about the results and suspects a minor possibility of an arthritis related disease or Hemochromatosis. At this point I had visited the medical sites on the web and Hemochromatosis was one of the things the website pointed out. The doctor comes in…he is in an obvious hurry, he confers with the resident in our presence reviews a couple test pages then says he wants more testing done to confirm or rule out possibilities and leaves the room. Within a few days I had many vials of blood drawn for testing and a ultrasound of the main organs in my abdomen. My return visit for answers…hopefully. The resident comes in the room like before and I am there by myself this time. She says the tests confirm multiple related issues going on. She begins with Epstein Barr Syndrome to which I tested postive. She goes on to tell me this is a form of Herpes. My mind is spinning, where did this come from? Herpes? I have only had one partner my entire life how could this be I asked her. She said its not what I am thinking that there are different types and the most common form is from contracting mono at somepoint then becoming a carrier for it. Going back I recalled someone at work saying they had just got over having mono, was that when it happened I thought? Honestly the more I think about it, the more I dispute this diagnosis because I never have any symptoms of this illness, nor has anyone in my family contracted this. If I was carrier wouldnt I have passed it along to others? Then why has that not happened? Again I dispute this finding for retesting at a later date. Going further she explains the liver levels are increased because I have cirrosis of the liver mine is enlarged… again I am thinking what?? I dont even drink or smoke, really? Next the arthritis RA factor came back high. Continuing she states, I am definitely borderline diabetic, no surprise there or so I thought. And lastly she says, I tested postive for two copies of the H63D mutation in the HFE gene, in other words, Hemochromatosis. She goes on to tell me that so far there is no indication of mutation in the genes, which is the only good news I have received so far. Technically the Alleles indicated H63D/H63D Homozygote proving positive for evidence of HH. Not being medically astute with all this I ask her what does this mean exactly and what are the treatments. She says there is nothing to be done for a carrier of Epstein Barr. She said the Rheumatologist will want more testing most likely and will decide exactly what related form of disease I have and he will treat it. The liver, she said to try to watch your diet and not eat too many fried and fatty foods. The liver disease is caused by the Hemochromatosis. In fact the diabetic issue, the liver issue and the arthritis diagnosis are all conditions of having Hemochromatosis. Okay, so how do we fix it I asked? We can’t she said there is no cure it is a gene malfunction and you need to let your children know they should be tested for the disorder because it is hereditary. She continued with sometimes bloodletting will lower the Ferritin levels preventing some additional damage to the liver and other possible organs. Wow and Oh are the only words that come to my mind at that point. The doctor came in and confirmed what she had told me, the appointment was over and a six month follow-up was scheduled. It was almost Christmas and my husband and parents wanted to know what are they going to do to help me feel better. When I told them nothing but recommended I keep the appointment with the Rheumatologist, they were upset. My mother was determined something must be available to help me and she went and talked with her doctor about me. You just have to love Moms!! She called me and said her doctor highly recommended I see if the blood letting procedure would be appropriate to help me. She said this procedure has been very helpful to many for the fatique. Meanwhile I again was researching Hemochromatosis, its symptoms, its treatments and its effects. The doctor left a lot out during my appointment in which I was told I had this disorder. It was never mentioned to me if nothing was done to help treat it (recognizing there is no cure) the Ferritin levels would continue to increase and damage my main organs leaving me to an untimely death. Umm, I think this is information I needed to know! Again the treatment listed was bloodletting or a some kind of injection for really severe cases. Putting it together didnt the doctor tell me I already had cirrosis of the liver from this disease? I believe most likely that it has taken a minimum of three plus years to discover this was the problem. I do not think I want to wait until I have heart and pancreas damage too before trying to minimize the effects of it. A call to my regular physician was in order. I contacted his office and asked about the bloodletting procedure and would I qualify to have this done? His office called me back and said he had ordered the procedure and I could come by and pick it up to take to a lab. I went that same day and picked up the order. I drove to the lab the very next morning to have the bloodletting done and another test that had been ordered. With the order in hand I registered at the front desk, prepared for this to take a little bit of time. I was called back within minutes, the attendant drew a vial of blood and said I was done. Its that brief moment when confusion sets in because what you just experienced didnt match up to what you expected. I said to the attendant I thought I had two orders, one for the test and one for the bloodletting. She replied I had given them two orders and she did the test, but the other one is written wrong. I said how is it wrong? She replied it just says Phlebotomy on it and thats what we do not a test. Huh? I told her no it was the test and pointed out the diagnosis/billing code on it indicating the purpose. She again said it was not a test and I needed to recontact my doctor for them to rewrite it. What else was there to say? I left disappointed and decided to wait until after Christmas which was at the end of the week to pursue it any further. Then the doctor was on vacation until the new year. Time is going by and still no help. So its been a while now since we first brought the chicks home, and things are much different. While we started out with just Orpingtons, we added to the group two Araucana chicks that we got in a raising backyard chickens class. The woman highly recommended them for the backyard along with a breed called Buckeyes. The baby chicks were not sexed so we didnt know what we were getting. The Araucana chickens orignate from Chile and are best known for their colorful easter eggs. As it turns out we have one hen and one rooster. They get along well with our Orpingtons. Enough time has passed and they have begun to lay eggs. Cold weather has also settled in our area. Our Orpington hens lay nice brown eggs medium in size, one about every other day. The Araucana hen lays an egg almost daily, small in size, blue green shell color with a very nice deep orange yolk. Now of course we have two roosters also, one Orpington and one Araucana. Both crowed very loud when they found their voice. We used narrow strips of velcro to make them crowing collars. We fastened them around the top of the neck under their feathers tight enough to barely put a finger between the collar and the skin, (allowing room for them to breathe). The collar helps lower the volume of their crow making it better for the backyard and neighbors. The collar does not stop crowing altogether. The Orpington and the Araucana are different in size. the Orpington is a larger bird that is poofie with feathers. The Araucana has more decorative coloring and is smaller and more slender, but very attractive. So far we are very pleased with our little flock. As we fast approach the 6 week age mark today, here is a sweet picture of Captain Rooster (the largest), Lavie Hen right next to Captain and Princess Leia the cream color hen. Yes! she finally has a name. Our foster boy named her, he is a big star wars fan. On our 6 week mark, we finally added the dark blue hen who we named Smurfette, and also a Golden Lace chick hen (not Orphington) who is black and gold. Her name is been decided as Lacey. Pictures of the two new ones, very soon. 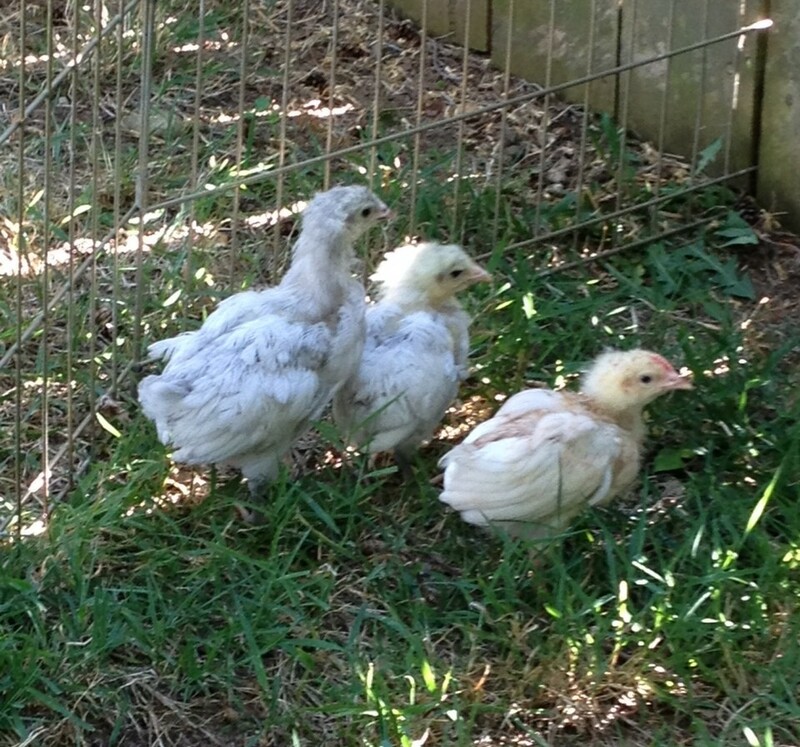 The two new hens are slightly larger than the other two hens. They are all doing great together and enjoy playing in the yard. They are now starting to look forward to me coming out and picking them up to play in the yard pen. Bugs are starting to be of interest, but they don’t seem to be quite quick enough to catch most of them yet. The other day I was gardening and found a nice big worm which I gave to them. It was hysterically funny to watch them take turns picking it up and being chased for it. I had no idea one worm could provide such a great form of entertainment and long meal. I am satisfied with our little brood of chicks. The breeder I got them from assured me the Golden Lace chicken will do just fine with the Orphingtons and is similar in size as well. I didn’t really want to mix the breeds, but wait until you see her, she is soooo pretty. Okay, so a chicken is like an ugly child, only someone who truly loves them can see the beauty. But that’s fine with me. We have now started adding some left over table scraps to their feed selectively. They especially like bread products. We will have to get their coop done soon as they are growing very fast! My next adventure with them will to research clipping their wings so they cannot fly. Any suggestions?? I came across this daily devotion by Max Lucado from his writing, Grace for the Moment. It resonated deeply and I wanted to share it with you. Quite a thought, isn’t it? Your name on God’s hand. Your name on God’s lips. Maybe you’ve seen your name in some special places. On an aware or diploma…. But to think that you name is on God’s hand and on God’s lips…my, could it be? Or perhaps you have never seen your name honored. And you can’t remember when you heard it spoken with kindness. If so, it may be more difficult for you to believe that God knows your name. But he does. Written on his hand. Spoken by his mouth. Whispered by his lips. Your name. As I sat thinking about this, it came to me I never have thought about my name being written on his hand or God speaking my name with his mouth. I have visualized my name written in His book of life, but not being spoken by God. Somehow the recognition of God saying my name aloud feeling so personal and specific about our relationship as Father and daughter. It puts things in a new light. It makes me feel humble to be recognized by God as an individual, it is truly beautiful. I hope you enjoy this devotional as much as I did. The three baby chicks are growing nicely. Two have names now, theres “Captain” our rooster and “Lavie” our lavendar colored hen. The third remains unnamed at this time. I contacted the man who I got them from about getting the blue one, but have not been able to get a mutual time for pick-up. The yellow fluff is almost gone and the pretty feathering is coming in. I now understand why each chicken pack needs a rooster, the hens are clueless without one. The two little hens wait for Captain to instruct them on everything and then they follow. Very much unlike the human female. I like to observe their behaviors it is curious to see them interact. Today was their first day out to play in the yard. I set up a nice pen and let them graze and play. At first they were scared, but then Captain noticed some bugs in the grass and went crazy pecking at them of course the two little hens followed pursuit. They had a grand time chasing bugs and playing in the grass. Tomorrow I hope to let them play even longer and take pictures. Stay tuned for the next update with pix.